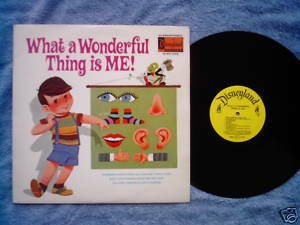 Disneyland STER1349 vinyl LP (1973) What a Wonderful Thing Is Me songs by Tom and Frances Adair, production by Buddy Baker, vocals by Jerry Whitman, Ida Sue McCune, Diana Lee (Title)/My Useful Nose/My Heart/Ears are Very Nice/Wonderful Eyes/What Dow We do?//Busy Little Fingers/Fresh Air Songs/Locomotion/You Don't Hear Much about Elbows/Be a Pal to Your Tummy/Activities Song An educational concept album about body parts with a surrealistic cover. Tracks have been played on KSPC-FM and compiled by Pizzicato Five. Record and cover are VG Please see the Disney section of our store for more great selections.